Confession: I’m afraid I’m allergic to real Christmas trees, and I’m definitely allergic to busy shopping malls. Does that make me a Scrooge? The holidays are always full of cheer but hectic. I’m tempted to take a nap before I deck the halls this weekend. 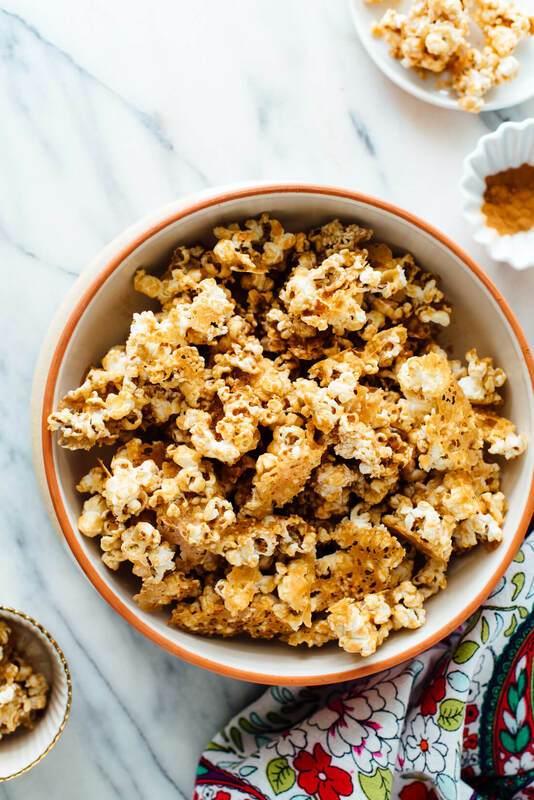 If you’re wondering what to bring to your holiday party, this caramel popcorn recipe is just the ticket. It’s naturally sweetened with maple syrup, and the sauce is thickened with tahini. If you’re familiar with Middle Eastern halva, this popcorn reminds me of it. Crackly sesame seeds and ground cinnamon make it even more irresistible. You have been warned. As I was typing up the recipe, I realized that it is gluten free, vegan and nut free as well. 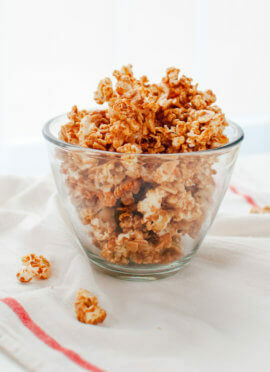 This popcorn is a special diet-friendly party option and a fun holiday treat. For an even more festive popcorn recipe, check out my peppermint bark popcorn. So good! 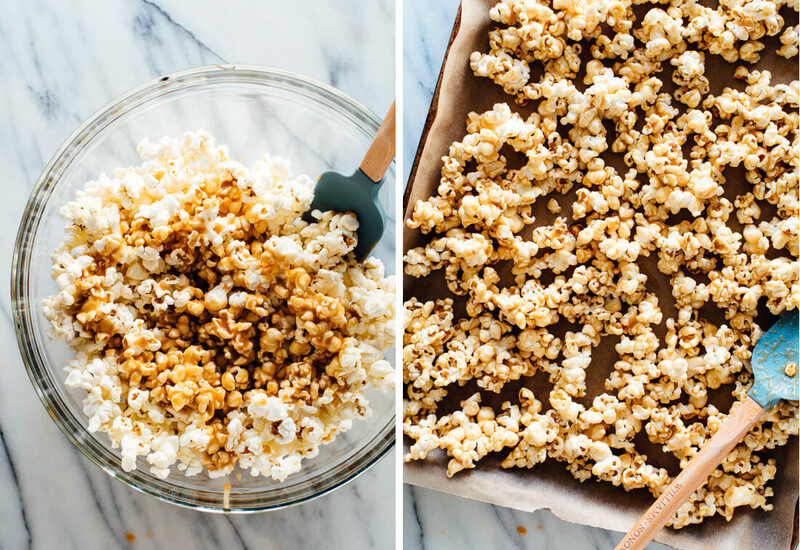 This naturally sweetened caramel popcorn recipe is incredible! It’s made with tahini, sesame seeds and maple syrup, and tastes a little like halva. 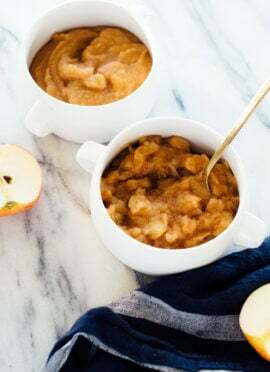 This recipe is conveniently vegan and nut free, and yields about 6 cups. Preheat oven to 350 degrees Fahrenheit. Line a rimmed baking sheet with parchment paper. Pop the popcorn: First, place a large mixing bowl near the stove. Pour the oil into a large, heavy-bottomed pan with a lid. Turn the heat up to medium, add 2 kernels of corn, and cover. Once the kernels pop, remove the lid and pour in the remaining popcorn kernels. Cover the pot and give the pot a little shimmy to distribute the kernels evenly. Cook over medium heat, shaking the pot occasionally. Crack the lid just a smidge so the popcorn stays crisp, and cook until the popping sound slows to about one pop per every few seconds. 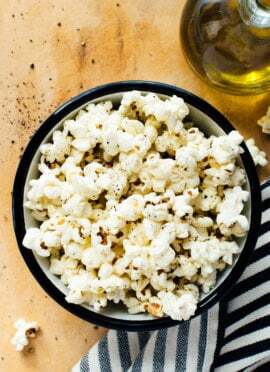 Remove the pan from heat and dump the popcorn your bowl, taking care not to pour in any unpopped kernels at the bottom of the pot. If necessary, pick out any unpopped kernels that made it into the bowl with a spoon. Meanwhile, to make the sauce: In a small, heavy-bottomed saucepan, bring the maple syrup to a boil over medium heat. Keep a watchful eye on the syrup and continue boiling for 2 minutes and 30 seconds, reducing heat only if necessary to prevent overflow. Remove the pot from heat. Add the tahini, vanilla extract, salt and cinnamon to the pot of maple syrup. 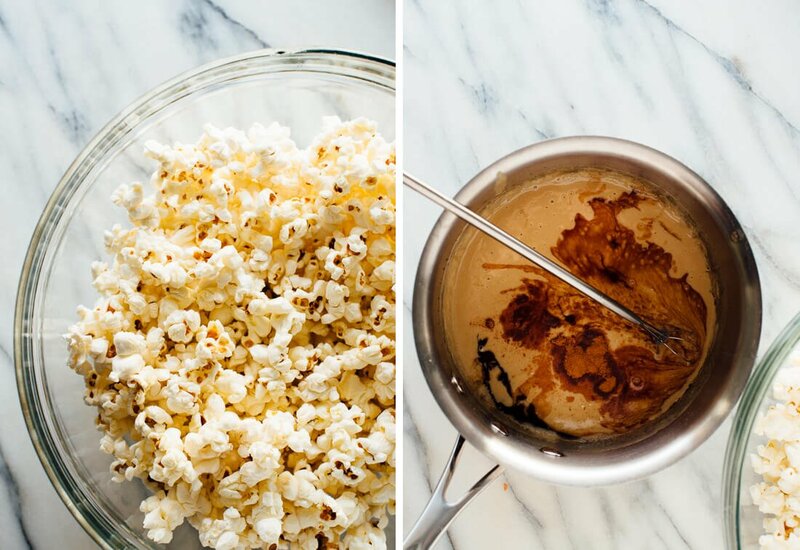 Whisk until well blended, then drizzle the maple mixture over the popcorn. Gently toss with a rubber spatula or big spoon until well mixed. Pour the popcorn onto the parchment-covered baking sheet and arrange it in a single layer. Evenly sprinkle sesame seeds over the popcorn. Bake the popcorn for 6 minutes, then rotate the pan and cook for another 2 minutes. Remove from oven and sprinkle with additional cinnamon and salt, to taste. The popcorn will continue to crisp up as it cools. 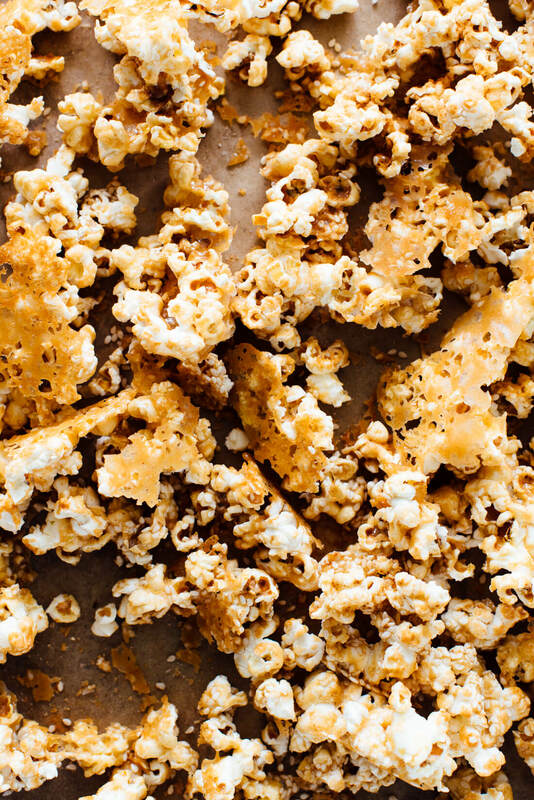 Once it’s cool, break the popcorn into pieces (or leave them in chunks!) and serve. This popcorn stays crisp for up to 3 days in an air-tight container. Change it up: Any nut butter can be substituted for the tahini (peanut butter, almond butter, cashew butter, etc.). You can also omit or replace the sesame seeds with chopped nuts of your choice. I love any easy way to get more sesame seeds (packed with calcium) into my daughter (Vegetarian… on her way to Vegan). 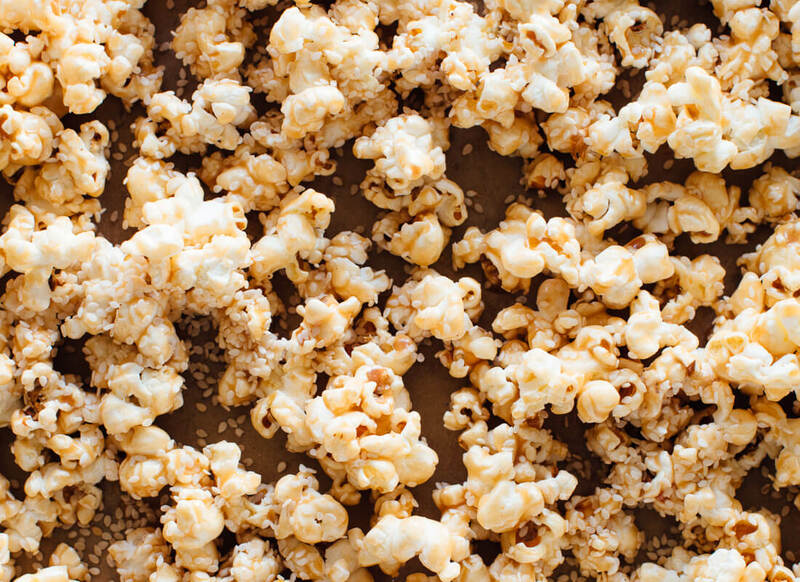 This popcorn is perfect in the evening with our favorite Christmas movies! Great! I am happy you like it. Thank you for your review, Kimberly. In the past when I’ve poured liquids or added a lot of moisture to popcorn it deflated and gets soggy. I was wondering if you’ve ever experienced this and what you did about it. I was slightly concerned about this too, having had a disastrous batch of popcorn balls from substituting date puree for sugar! In this case, I think it wasn’t an issue because of how similarly maple syrup behaves like a caramel made from sugar. This was super yummy – the sesame taste was subtle and yet made this feel very special. I have made numerous recipes from your new book and newsletter. Some have been repeated. Every one has been a success, tasty, easy to follow directions, not time consuming. It is a joy to prepare and eat beautifully prepared real food. I haven’t made this popcorn yet but will do so very soon. Will be nice for guests. Homemade is always best, no additives or preservatives. Thank you. I’m allergic to corn (yes, I know), but LOOOOVE tahini, maple, and cinnamon. What other things could I use this sauce on? Hmmm, maybe Rice Crispies or Chex Cereal (I’d buy the more natural options) or mixed nuts? Can you pop it in an air popper? Will it affect flavor? That would work! I just prefer stovetop popcorn flavor. This flavor combination is UNREAL!! It’s a wonderful combination! Let me know what you think when you try it, Natalie! This sounds delish! Could you actually use this for nuts? And can you replace the maple syrup with golden syrup and/or honey? I’m going to bring this to a holiday party tomorrow! Thank you, I’m so excited. Yes! I’ll be making it again to put out on Christmas Eve, and this time I’ll add some nuts, because we love those too. So easy! Would it make a difference if I used popcorn from an air popper? Hi Kate! 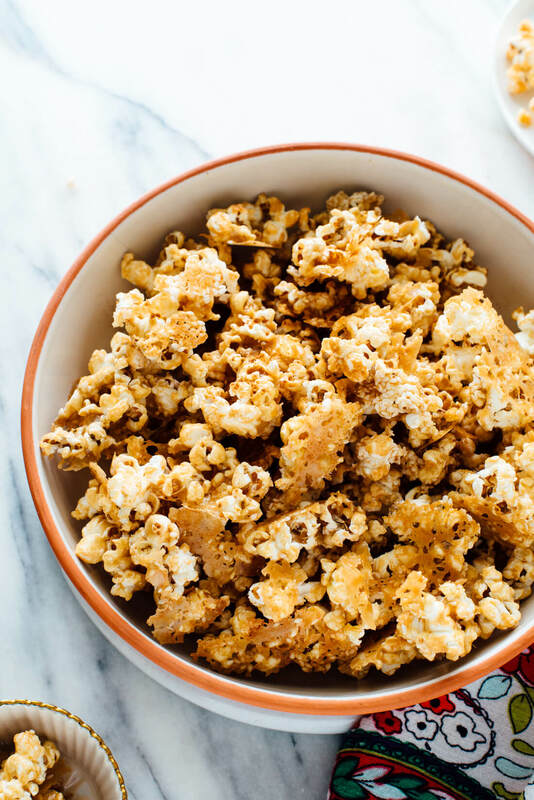 This may be a super stupid question, but have you had success with this recipe by just using regular, plain store bought popcorn to make this recipe (aka just skipping the whole pop-it-yourself part?) Wondering if it would affect the end product. I’d probably not add more salt since bagged popcorn is already salted. Let me know of your thoughts! A little pressed for time before a holiday party, but am REALLY wanting to bring this as my potluck dish! Hi Jo, I think you could do that! I just love fresh stovetop popcorn. I just made this popcorn, and it is so yummy! Thank you! I think I might try substituting date syrup for the maple. Great! Thank you, Cynthia for sharing. This turned out perfectly and is delicious. I’m addicted. btw – I air pop my popcorn in the microwave by putting raw kernels in a plain brown lunch bag. microwave on high for three mins. and the corn is perfectly popped. this worked fine for this recipe. That’s what I like to hear! Thanks for the review. I see this popcorn recipe looks very different ,i like these types of recipe.these are looks very yummy.thanks for sharing with us. Just made this as directed and it is awesome!! Love the sesame flavor and it is much lighter than the standard caramel corn. It crisps up nicely, too. Thank you! Mmmmm… I just made this, and it’s great! I live in Kuwait, and we always have tahini; we eat a lot of dates and one way is to just dip them in tahini. Thanks for the recipe. Oh my goodness! This recipe is sooooo tasty. My only complaint is that I felt guilty using so much expensive maple syrup. Do you think there would be any way to reduce the amount? I wouldn’t mind it a little less sweet but I would hate to miss out of that amazing caramelization. Could I up the tahini and reduce the maple? Julie, I’m sorry for the slow response! I missed your comment earlier. I am really not sure if you can tinker with the proportions here, since tahini is so thick and maple is thinner. I buy maple syrup in big jugs at Trader Joe’s or Costco and it’s more affordable that way, hope that helps! I had to pat myself on the back after making this recipe and I didn’t even create it. It’s perfect for a sweet/salty snack and a bit cheaper than your almond butter version. I like to make a big bag and chomp on it for a few days. Love the popcorn, the blog, and everything you’ve got going on. You should pat yourself on the back! Thank you, Cayla.